Vancouver, British Columbia – Velocity Minerals Ltd. (TSXV: VLC) ("Velocity" or the "Company") announces that it has received positive results from trench sampling, extending known near surface mineralization at the Rozino gold project ("Rozino" or the "Project"), located in the Tintyava Property, Bulgaria (Table 1, Figure 1). Geological mapping completed in conjunction with trench sampling resulted in the discovery of altered subcrop (Plate 1, results pending). "Velocity's recently announced positive PEA was based on exploration and drilling to date. Management believes that there is potential to expand mineralization at Rozino beyond the extents of the pit outlines established in the PEA," stated Keith Henderson, Velocity's President & CEO. "These trench results together with rock samples collected during recent mapping support the potential for resource expansion and we look forward to drilling these targets in due course as part of the Rozino joint venture." 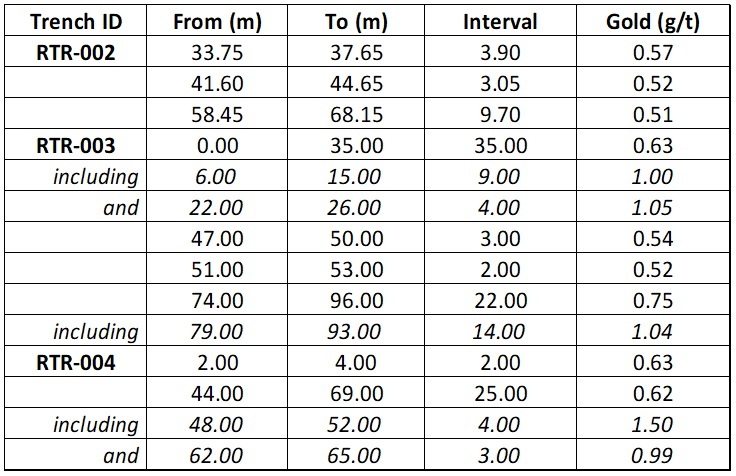 Table 1: Detailed trench sampling results. Note 1. It is not possible to determine true width based on exposure within trenches. Sample results from trenches RTR-002, -003 and -004 are exclusively located outside of the pit limits established in the recently released NI 43-101 preliminary economic assessment, providing evidence that mineralization extends beyond the areas of previous drilling. Figure 1: Trench locations and highlights of sampling results. Plate 1: Sub-cropping and float rock samples collected east of existing resource mineralization at Rozino. A. Low Sulphidation Epithermal (LSE) breccia in float adjacent to RTR-003. 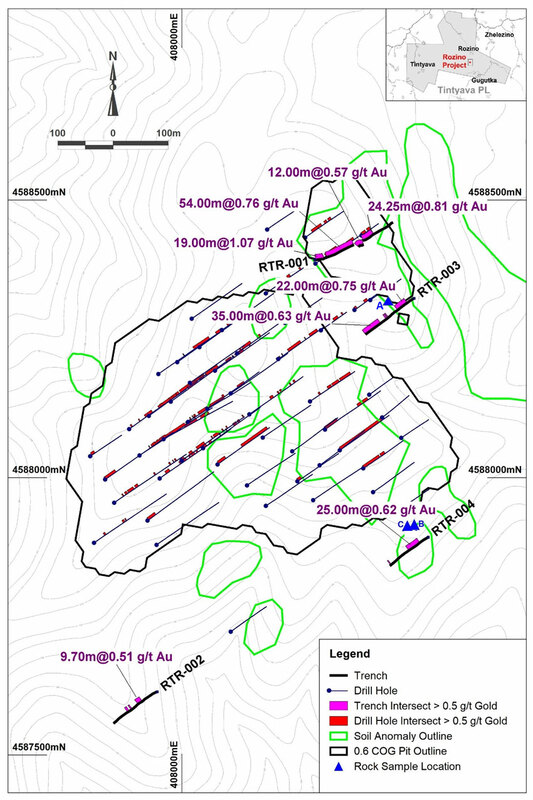 The presence of subcrop and float adjacent to new trenches at Rozino are coincident with untested gold in soil anomalies and significant trench intercepts. 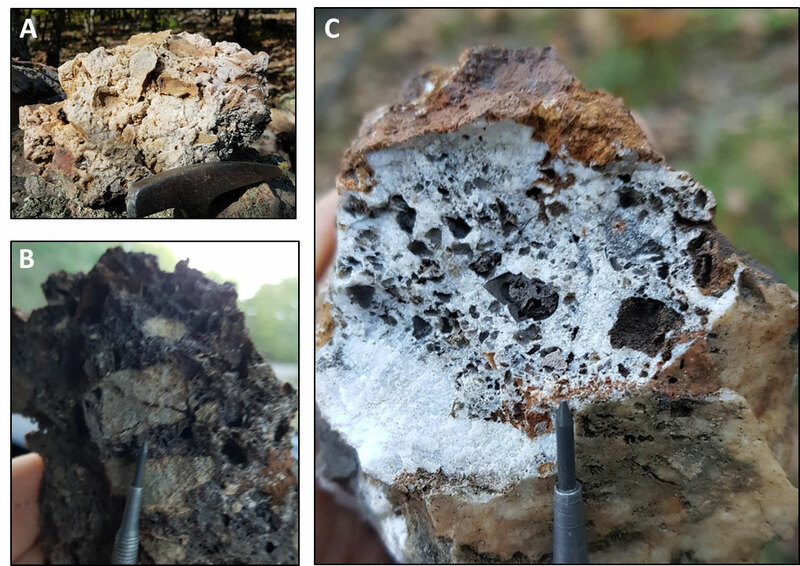 The style of mineralization and presence of silicified breccias in subcrop and float is in accord with the Rozino deposit and demonstrates that mineralization extends outside of the existing mineral resource. The work program at Rozino was designed and is supervised by Stuart A. Mills, CGeol, the Company's Vice-President Exploration, who is responsible for all aspects of the work, including the quality control/quality assurance program. On-site personnel at the project rigorously collect and track samples which are then security sealed and shipped to ALS Global laboratory in Romania. Samples used for the results described herein are prepared and analyzed by fire assay using a 30-gram charge in compliance with industry standards. Field duplicate samples, blanks and independent controlled reference material (standards) are added to every batch of trench samples. Velocity began exploring and drilling at Rozino in August 2017 and published a maiden Inferred Mineral Resource estimate in March 2018. The Company completed additional drilling in 2018 and published results of an updated mineral resource estimate and Preliminary Economic Assessment in September 2018. The PEA provides a base case assessment of developing Rozino by open pit mining, on-site crushing, milling and simple flotation to produce a 30 g/t gold concentrate. The concentrate would then be trucked 85km on existing roads to the currently operating CIL plant where saleable gold doré would be produced. Mineralization remains open for expansion. Having delivered the PEA, the Company has exercised its option for a 70% interest in the project and will move forward in joint venture with its Bulgarian partner, with Gorubso-Kardzhali AD.